I’ve had a few calls as well as personnel observations regarding “worms” and their damage in corn ears. European corn borer seems to be making a bit of a comeback. Although these reports have been locally heavy, they have not been widespread. Western bean cutworm complaints have certainly increased from previous year, especially on traited corn. Fall armyworms, which migrate to Wisconsin, had a surprisingly early migration and their damage can mimic injury caused by other ear feeding insects. 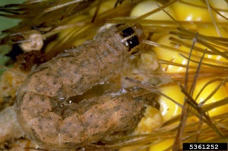 Finally, corn earworm is another one of those late-season migrants which arrived in very heavy numbers at some locations during the 2016 growing season. Normally it is not a field corn pest but when migrating populations are this high, field corn can be a host. One clue that you have an infestations of corn “worms” can be significant bird damage to the ears. Diagnosis of the injury can be important when planning for the future. However, diagnosis of injury symptoms can be a little tricky and not always definitive based on symptoms. Below is a quick synopsis that can be used for identification of both the larvae as well as type of damage. European corn borer (ECB), as mentioned earlier, is making a bit of a comeback presumably because more conventional corn is being planted. They are normally controlled by hybrids expressing above ground trait(s). ECB have a very dark head (usually black) and a lighter cream to tan colored body and may grow up to an inch in length. Depending on the area of state, there is either 1 or 2 generations/year. However, I have had a few reports of a third generation this summer. 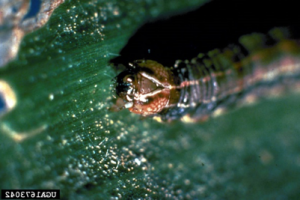 Larvae from the third generation do not mature in time to overwinter successfully. Diagnosing injury can always be a little difficult, however, ECB larvae may still be present in the ear and the injury is typically confined to a smaller area on the ear tip if compared to other insects. ECB are also more likely to burrow into individual kernels and/or the cob. You also would expect to find ECB injury in ear shanks as well as tunneling within the stalks. 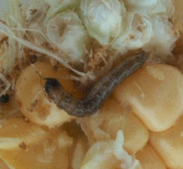 Western bean cutworms (WBC) are dark to light brown, without distinguishable stripes or dots and their skin is smooth. They will grow up to 1 ½ inch and the later instars will have two short/broad strips behind the head. WBC complete 1 generation/year and leave the ear to pupate in the soil. Injury to the ear can vary from light surface feeding on kernels to complete consumption of large areas of kernels. Molds may be found on the ear but this is not diagnostic of only WBC. They are not cannibalistic; therefore, more than one larvae may feed on each ear. WBC injury is often associated with sandy soils. Several states in the Midwest, have had repots of significant WBC injury to traited corn. Fall Armyworm (FA) is a species which occasionally migrates to our state. Larvae may be up to 1 ½ inch long, have variable coloration (green, light brown to almost black), smooth skin and light striping on their backs. A diagnostic feature of FA is an inverted white “y” on their head located between their compound eyes. Damage depends on crop stage and can range from leaf feeding to significant kernel injury on both the tip and sides of the ear. 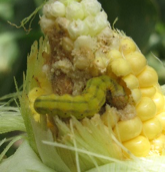 Corn earworms (CEW) feed on a variety of crops, including sweet corn. Although an infrequent field corn pest, feeding can be significant during years of heavy pressure. CEW vary in color and can be green, yellow, brown, tan to almost black. All CEW larvae will have a tan head. CEW can easily grow to 1 ½ inches long and later instars have easily recognizable striping. Early instars will have small black hairs identifiable if you have magnification. Earworms usually enter the ear through the silk and damage is concentrated at the ear tip, however injury can be severe on any part of the ear. What can separate CEW injury from WBC and FA is that the latter two species may chew holes into the husks. There are no effective control treatments for these insects once these insects have entered the ear. However, proper identification can help develop management plans for the future, if needed.